A great shoe for ladies with “tender toes” and painful bunions. For some reason, I’m on an uber-comfort kick! spotted one of our patients in these shoes and told me I had to write about them on the blog. This patient has severe peripheral arterial disease, fragile skin and painful hammertoes and calluses. She claims that they are the best shoe she has ever owned and I believe her. She is elderly so it benefits her to have a light shoe and this shoe is very light. The shoe has a supportive sole that is rigid enough to protect the foot of someone but also has shock absorption for more comfort. What really sets this shoe apart is the material it is made of – the toebox upper is made of a “stretchy nylon textile and leather combination” that puts minimal pressure on the toes and bunion. If you work on concrete floors for extended hours or are very active, this shoe is probably not the optimal shoe for you. 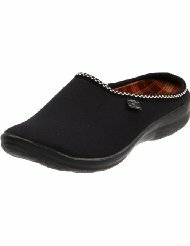 This shoe is great for light wear and especially for elderly people who aren’t as active as someone who works forty hours a week on their feet. If that is the case, you need a shoe with more rigidity across the forefoot area than this shoe so as to have less motion, which makes it much more protective and comfortable. I highly recommend this shoe for anyone who is elderly and has “tender toes”. Although I am not a fan of shoes that do not have proper rearfoot strapping for biomechanical control, I do recommend this shoe for certain patients. Particularly, any patients who have painful bumps on the back of their heels and can’t tolerate a strap. 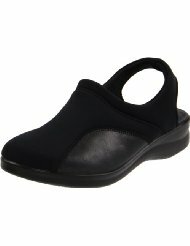 Also, for patients who can’t bend far enough to tie laces and need a comfortable slip on shoe. This is an excellent choice because of the protective sole, the wide toebox and the “lip” in the rearfoot area which does allow for some biomechanical control of the rearfoot. When it comes to the rearfoot – some control is better than no control. If there is no rearfoot control, it forces you to “grip” your toes down which can help promote hammertoes, corns and a multitude of other problems including knee hip, lower back pain and “tired-leg syndrome”. For more information on this subject, please refer to my article called “The Basics” in this blog.